Sara Armstrong is an educational consultant, keynote speaker, presenter, and writer working to provide resources and tools for change in education. Contact Sara Armstrong today for help in your school or district. Comments Off on Who are Your Heroes? In some sense, we are all heroes–if only the heroes of our own lives. What does it mean to be a hero? What is the difference between heroes and celebrities? These and many other intriguing questions are asked and answered at the MY HERO Project website. 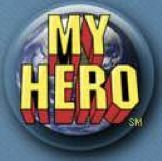 Featuring hero stories—people living and dead, famous and not so famous short films, and artwork, this free site also invites teachers to create pages for their classes of their own students’ work, or hero stories around a theme such as women or black history. Storytelling distinguishes us from all other animals. Stories are how we learn, how we make sense of the world, how we transmit important values to each other, and how we share who we are. Technology tools now make it easy to combine images, narrative, music, and special effects to tell a story. Digital storytelling combines these aspects to make something that can’t be done by any aspect alone and the result is something even greater than the sum of its parts. The Center for Digital Storytelling has been inspiring people to tell their stories for a number of years. Joe Lambert’s seminal book, Digital Storytelling: Capturing Lives, Creating Community, deliciously describes the why and what of digital stories. Joe focuses on the story, not the technology, to enable us all to share ourselves effectively through multimedia. See examples and other resources at the Center’s website as well. Outlining exactly what teachers and students can do to get to the best questions for defining their inquiry-based project-based learning efforts, the authors encourage critical thinking and problem-solving at all levels. Teachers thoughtfully create a theme, based on what they want students to learn and be able to do, then carefully orchestrate the question process–empowering students and transforming how classrooms work by turning responsibility for the questions over to the students. The many years of research and practice that inform this book began with helping people with health issues be better advocates for themselves by formulating the right questions, and teaching ESL parents what to ask to support their children’s education. Also see The Right Question Institute’s web page, which provides information and educator resources. Take a look at an article by the authors: Teaching Students to Ask Their Own Questions, in the Harvard Education Letter.